This is a once in a lifetime winter driving experience, professionally presented with highly qualified instructors and luxury European cars. Suitable for groups of 10+ people our ice driving experience is one our customers walk away with big smiles after a unique, exciting and memorable day on the snow. Each group will be professionally instructed by our highly-qualified instructors where each person will be guided through the basics of driving on snow and ice, before progressing into the intricacies of dynamic driving and car control – here you’ll experience the thrill of drifting including a snow circle and slalom course. Upon arrival to our unique location and mountain event centre each group will be welcomed, briefed and introduced to the instructors and cars whilst enjoying a fresh morning tea in front of the roaring open fires. After this the morning drive session commences and with a quick stroll across the bridge the driving is underway. The morning session finishes after a good 2hrs of driving where guests head back to the event centre for a full buffet lunch and a chance to warm up inside. Lunch is all that separates the morning and afternoon driving sessions – the emphasis is on getting as much driving as possible. The day finishes in a culmination of the skills that have been learnt and refined during the day with timed laps on a coned snow and ice autocross course where bragging rights and the winners cap will be awarded. Exclusively for groups of 10+ our ice driving experience is the ultimate in driving experiences - you'll receive expert tuition in brand new cars in an exclusive alpine setting at an award-winning winter proving ground. Please contact us if you would like some further information on our day drive experience. Our Ice Drive and on-mountain overnight experience incorporates our signature ice drive day partnered with our on-mountain apartment style accommodation. 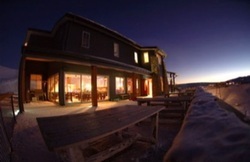 An amazing once in a lifetime mountain experience including full catering in a spectacular and alpine setting. Our on- Mountain apartment style accommodation is perfect for corporate groups of up to 32 people (twin share) or for individual king size style rooms of up to 16 people. 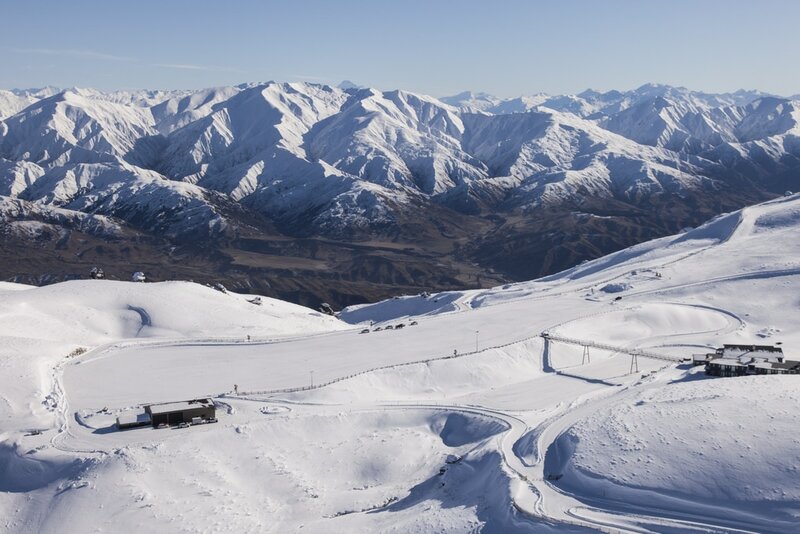 The location and outlook is simply outstanding, looking out over the speciality groomed ice driving facilities to the Southern Alps beyond – you’ll experience a winter sunset (and sunrise) that you will remember for a long time after. The apartments are 4+ star with comfortable beds, private lounges and great central heating. All a short stroll from the event centre where full catering is included. The bar and restaurant is fully serviced and hospitality can be enjoyed privately for the duration of your stay. Groups can choose whether they would like to stay on the arrival night or on the night of their day drive. Some groups like to drive up the day before then be back in Queenstown the night of the drive day and others arrive up for the drive day and stay after – the choice is yours. For corporate groups wanting to also include meetings, conferencing or product demonstrations the overnight experience provides a great platform for evening speakers or even conferencing the following day. Please contact us if you would like some further information on our overnight experience. 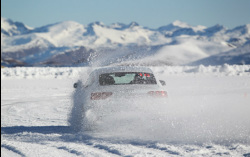 The SHPG ice driving experience is based out of the multiple award winning Southern Hemisphere Proving Grounds near Queenstown - the place where auto manufacturers from all over the world come to secretly test their vehicles. You will experience first-hand the thrill of driving on these industry standard and expertly prepared snow and ice tracks. There are multiple ways to get to SHPG - we can work with you to arrange transfers, however if you prefer to self-drive its advised that you allow 1hr 15min from Queenstown and 45mins from Wanaka. Road transfer companies take approximately the same time. 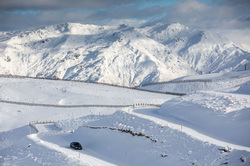 ​The road to SHPG if you are coming from Queenstown does pass over the crown range, please be aware this road at times can be affected by weather. 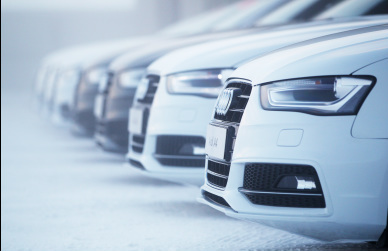 The Premium Ice Driving Experience is perfectly suited to groups - whether its a conference, incentive, private or corporate groups we can design a day to meet your exact needs. Developed as a progressive drive day so the ice driving experience is achievable for different levels of driving ability and can be structured to any size of group. The private lodge setting also is also exclusively yours for the day, the drive day can be tailored to fit in meetings, speakers or conferencing content during the day and also combined with other break-out activities such as husky sled dog rides and snow shoeing. We aim to offer you the complete package in terms of group experiences - once you arrive you’ll enjoy a fully hosted experience including catering & luxury accommodation if staying the night. We can also provide photographs and certificates to take away if needed and awards for fastest drivers / best teams and video footage for bragging later to the ones that couldn’t make it! Our entire Event Centre is nestled closely together and walking distance from all facilities. Moments after getting out of the driving seat, you’ll be back in front of our big open fires in the event centre enjoying a barista made coffee and warm Southern hospitality – this entire package culminates in to the ultimate in what New Zealand has to offer in terms of location, hospitality, experiences and venues. Accommodation can be either set up as double or twin share – there are 16 luxury apartment style rooms, so the maximum on-site capacity is 32 people. Each apartment has a lounge & kitchen area with its own private fire and balcony - the scenery is breathtaking looking out over the southern alps and the stars at night have to be seen to be believed. Staying a night fully catered for and hosted in the mountains in complete comfort is a very unique and memorable experience for any guest. 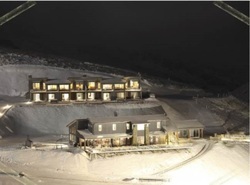 Relax and enjoy the spectacular Southern Alps backdrop as we welcome your group with locally crafted canapés & drinks at the SHPG Event Centre. You will be treated to an 4-course dinner from a regionally themed menu including dishes such as organic beef fillet, wild venison, free range pork, New Zealand lamb and fresh fish & game. Our experienced wait staff will ensure your dinner is enjoyed comfortably in front of the warm fires and cosy atmosphere of the SHPG ice driving event centre - it might even be snowing outside! Enjoy a bountiful selection of hot and cold breakfast options at SHPG ice driving event centre including a range of fresh local juices, espresso coffee and fine tea selection. Guests arriving for the day drive are required to be at the event centre by 9am. Barista made coffee and fresh muffins are available as we get everyone signed in and briefed on the day ahead. The instructors will be introduced, have a brief overview of the day’s activities including safety requirements & break into groups and being assigned to instructors for the day. Once completed everyone will grab their winter gear and head out onto the driving facilities as round 1 begins. Head out onto the snow and ice facilities with your instructor and group where the lead instructor will take you through a morning of activities. Time to head back to the event centre a two course buffet lunch will be waiting and you will have a chance to enjoy some fine southern fare, warm up in front of the fires and enjoy the hot and cold refreshments on offer. During the afternoon session you’ll get ample time to perfecting your driving skills - you will experience the true feeling of drifting. Using the accelerator to control your car with small steering inputs you’ll develop full control of the car and hone your skills for the autocross course. Now you have honed your skills it’s now time to test them against the others, you’ll get a chance to take on a coned autocross course that combines all the skills you have learnt during the day – who will take out the fastest time and walk away with the winners hat? At the end of the day one of our expert instructors will take small groups on spirited drive around our snow facilities – they’ll show you how its done! We’ll move back into the Event Centre for a quick prize giving. The fastest on the day will get a winners hat then it’s time to pack up & transfer back to Queenstown/Wanaka or you can add on a second night, enjoy a cold beer or mulled wine, kick back, relax and share a few stories with our instructors! Custom conference, meeting or C&I driving experience - Please contact us to design the ultimate experience! Minimum numbers apply, commissionable pricing available on request for registered wholesalers & event management companies. Inclusions: full driving experience, professional instruction, luxury European cars, fully hosted catering including barista made coffee and exclusive use of our Event Centre.